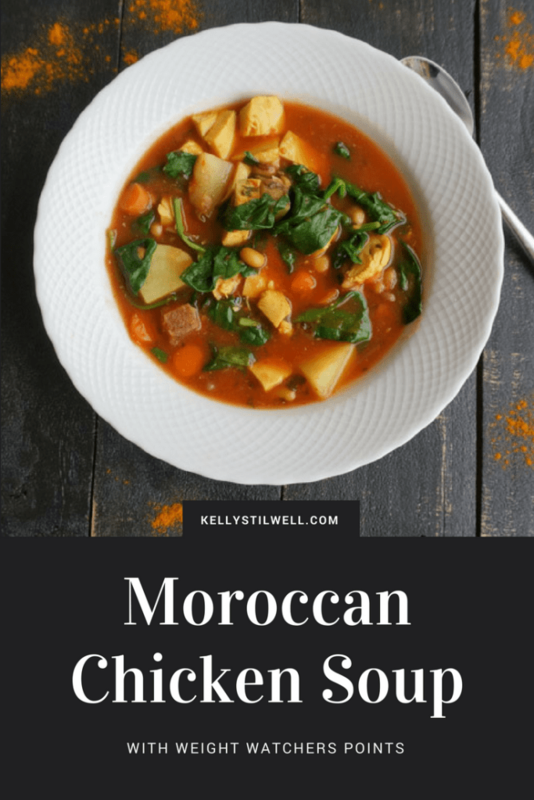 I love the flavors of Morocco, and this Weight Watchers Soup made Moroccan style was an easy and delicious dinner. Spices like turmeric and cumin add such an interesting and complex flavors. Each time I use these two together, I wonder why I don’t do it more often. I started off with a baked chicken recipe with lemon and herbs. 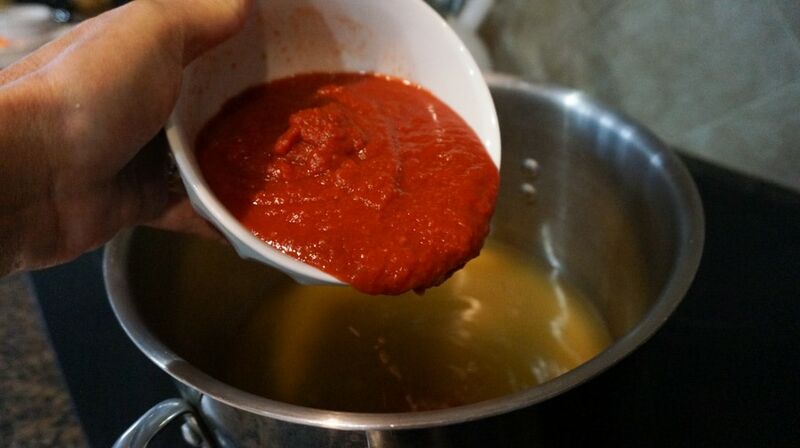 It turned out great, and we had quite a bit left over that I decided to turn into soup the next day. If you want to do exactly what I did, brine the chicken and bake in a 400° oven with fresh thyme and parsley for 30 minutes. I had planned to make Weight Watchers Moroccan Chicken and Couscous Soup from the site but decided to use potatoes instead of couscous as I had just bought a big bag of potatoes and realized they were fewer points. 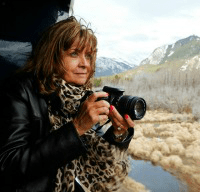 I like changing things up to create something new! 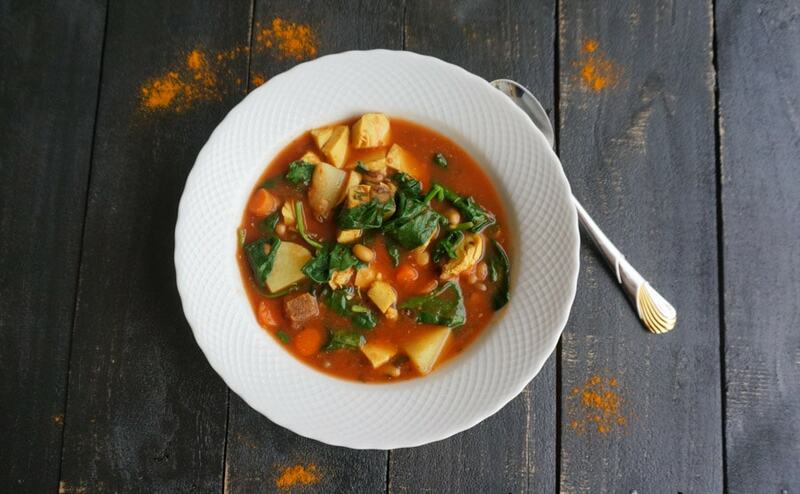 This soup is so easy and my family loved it. Gather your ingredients. Bring the broth, tomatoes, carrots, potatoes, cumin, and turmeric to a boil in a large covered saucepan. 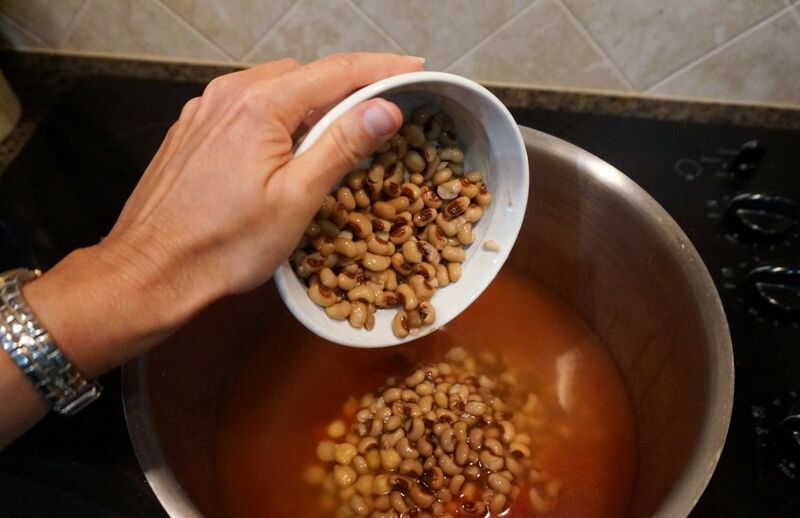 Add black-eyed peas and chickpeas. 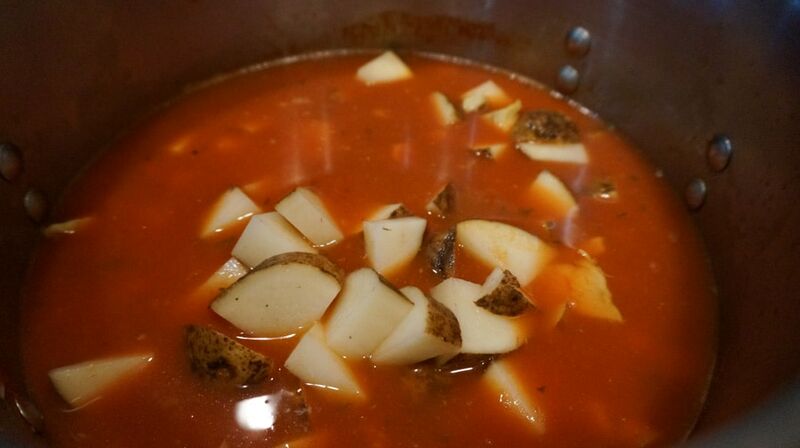 Reduce the heat and simmer, covered, until the carrots and potatoes are tender, about 7 minutes. Add the cooked chicken and heat through, about 1 minute. 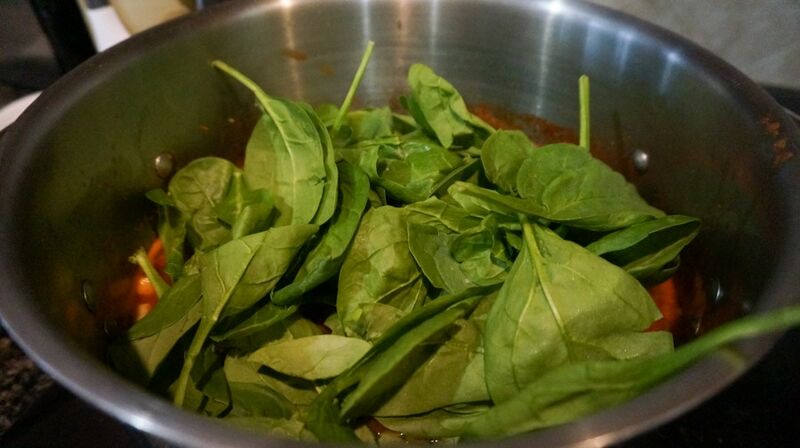 Add spinach and remove from the heat, cover, and let stand until the potatoes are tender and the spinach wilts, about 5 minutes. Yields 1 1⁄2 cups per serving. 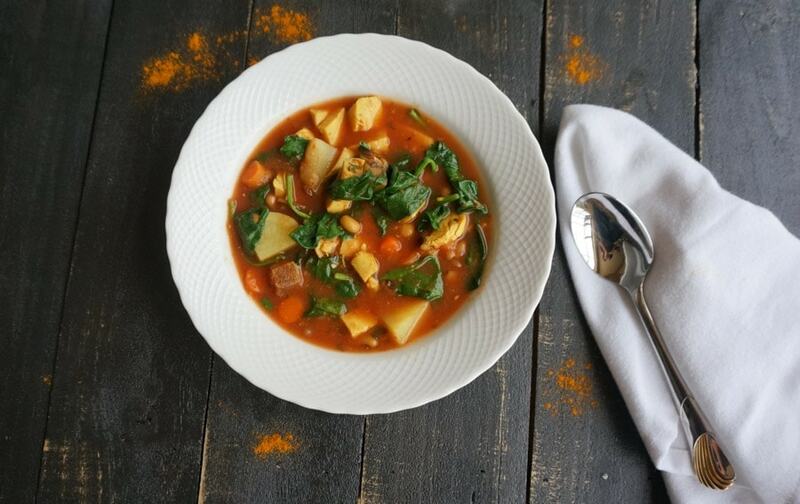 The Weight Watchers Moroccan Chicken and Couscous Soup on the Weight Watchers site is 3 points and this is the same recipe with potatoes instead, which are actually fewer points. Enjoy! Looking for other delicious Weight Watchers recipes? If you love comfort food, you’ve got to try this Weight Watchers Chicken Pot Pie. You’ll also find a lot of great family meals in this roundup of Italian Weight Watchers meals. Rather use your slow cooker? 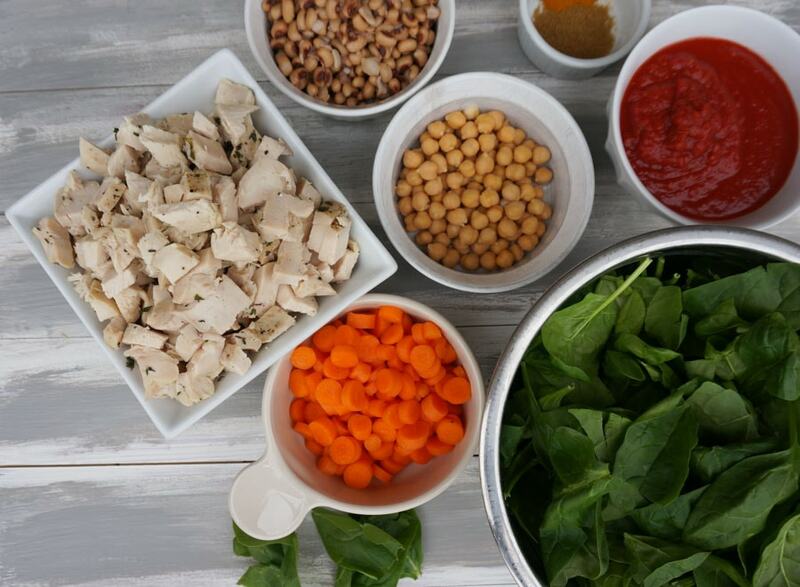 Check out these Fix It and Forget It recipes or these Weight Watchers Meals for the Crock Pot. If you’re following a gluten free diet, you’ll find a lot of recipes that work with Weight Watchers. Just be sure to check labels! Check out these Gluten Free Weight Watchers recipes. Love these recipes? Subscribe and you’ll never miss one! Check out my Best Weight Watchers Recipes Pinterest board for more recipes! So sweet of you to say. This is one of my favorites!